I typically try to steer clear of beers in this price range as they usually only lead to disappointment, this one however I had to buy! Having recently had 4 of Weltenburger Kloster's other beers and really enjoying them, plus having the mug, it seemed like I had no choice but to buy this beer. The photo is a bit average but it's a really hard mug to photograph because of the gold lettering, and I may have had a couple before having this beer... Anyway I had this while watching the Tour de France last night and will be using my notes from then to write the review, hopefully it makes a bit of sense and my English is better than the last few days. 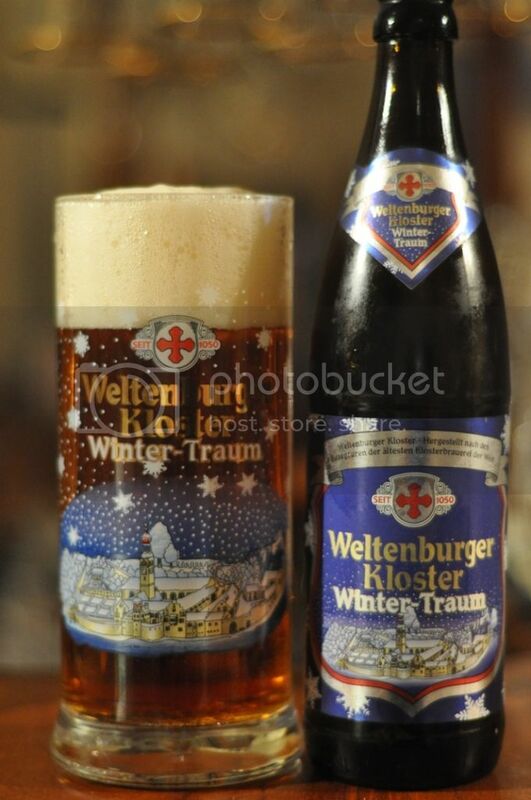 Weltenburger Kloster's Winter Traum is a clear deep amber colour with a monster 4 finger head of relatively loose creamy foam. There seems to be a reasonable ammount of carbonation as the head hung around for ages with good amounts of lacing and retention. It's a lovely looking beer, it basically looks like a clear amber ale and it looked even better in the glass. On the nose this beer was incredibly aromatic. It had a huge amount of fruit characteristics to it with peaches, cherries, plums etc. all present and quite noticeable. There is large amounts of brown sugars and toffee notes as well, however I can detect little to no hops. Maybe there were some when drinking but I haven't included it in my notes on the smell of this beer. Still though it's a nice smelling beer. The first thing I noticed about this beer was how light it was in the mouth, it was just amazing for a comparatively dark beer. In terms of flavour it was very sweet, so this may turn some off it. There was lots of brown sugar present upfront before the fruits noted in the nose came through. The carbonation was lower than expected and this really added to the overall complexity of this beer. I was hugely impressed with this beer! Winter Traum is German for winter dream and this beer is exactly that! This beer was exactly what you want when watching sport after midnight, it was a beer that you could easily sit and enjoy over a long period of time. It got better and better as the beer warmed and is one that I will certainly be buying again despite the slightly inflated pricetag. Certainly a great warming beer for winter!